With reports circulating that the Cardinals won’t bring him back next season, Steve Wilks and the rest of his coaching staff have decided to go bold with their play-calling as they try and play spoiler against the visiting Los Angeles Rams. For one of their final decisions in charge, they decided to give 35-year-old Larry Fitgerald a chance to throw the first touchdown pass of his career in what might be the last home game of his career. 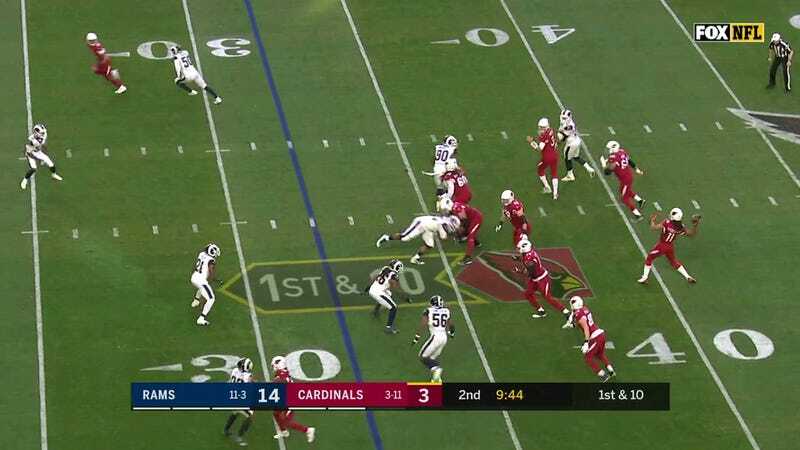 After getting the quick screen-pass on the left side of the field, Fitzgerald found a wide-open David Johnson darting towards the end zone, and connected with the running back on the 32-yard touchdown. Better to get this accomplishment done late in your 15th season than never, right?